The number of repeat clients increased significantly in 2016, which makes us believe that 2017 will be another positive year if we are able to keep up with our good performances”. 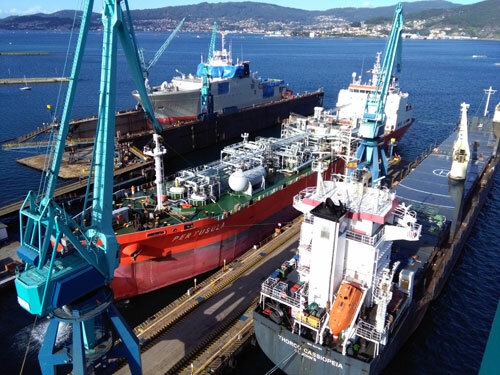 Latest repairs included Marconsult’s 10,610 dwt general cargo vessel Thorco Cassiopeia, which completed the replacement of her crankshaft on her MAK 9M32 main engine, and the Peruvian Navy’s research survey vessel Bap Carrasco. Two repairs must be highlighted, due to the scope of work and very limited time of repair - these were the fourth intermediate survey on-board Carboflotta’s 17,750 dwt LPG tanker Pertusola. The most time consuming item was the piping renewals, although there were other important jobs like the removal of the steering gear in order to renew the joints, major steel works in double bottom tanks and triturator room, renewal of ventilation ducts, cargo condensers and pumps, removal of both hydraulic windlass winches, modification of the cargo pipeline and renewal of its insulation. This was followed by Bourbon Offshore’s 4,400 dwt platform supply vessel Bourbon Clear with the Ulstein X Bow and dynamic positioning Class II, which completed her first special survey. The main workspec included cleaning of 13 box coolers, major stainless steel piping repairs in the cargo system and the maintenance of the bow thrusters and azimuth thruster. Also in the yard is Liberty Blue’s 7,890 dwt general cargo vessel Tip Leer currently undergoing her third intermediate survey and it is expected to undock at the end of the month.